Members of the International Space Station's newly expanded crew faced the camera last week. 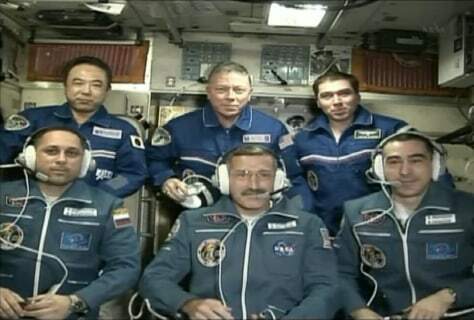 Top row (left to ight): Japanese astronaut Satoshi Furukawa, U.S. astronaut Mike Fossum and Russian cosmonaut Sergei Volkov. Those three have since returned to Earth. Remaining are, bottom row (left to right): Russian cosmonaut Anton Shkaplerov, NASA astronaut Dan Burbank and Russian cosmonaut Anatoly Ivanishin.